U.S. Virgin Islands with its capital Charlotte Amalie is located in North America (Caribbean, islands between the Caribbean Sea and the North Atlantic Ocean). It covers some 1,911 square kilometers (twice the size of Washington, DC) with 107,268 citizens. English is the language commonly spoken used by the people in U.S. Virgin Islands. This country shares no land borders with another country. The U.S. Virgin Islands is an unincorporated organized territory of the United States of America between the Caribbean Sea and the North Atlantic Ocean, east of Puerto Rico. Getting around any of the Virgin Islands is fairly easy. All of the islands have bus service and/or a regulated taxi service. Upon docking at Cruz Bay, taxis, rental cars, and scooters are available. The landscape is mostly hilly to rugged and mountainous with little flat land. The average density of population is about 56 per km². The climate in U.S. Virgin Islands can be described as subtropical, tempered by easterly trade winds, relatively low humidity, little seasonal temperature variation with rainy season September to November. Potential threats by nature are frequent and severe droughts and floods, occasional earthquakes and several hurricanes in recent years. To reach someone U.S. Virgin Islands dial +1-340 prior to a number. The local cellular networks are operated on 850 MHz, 1900 MHz. Websites typically end with the top level domain ".vi". If you want to bring electric appliances (e.g. battery chaarger), keep in min the local 110 V - 60 Hz (plugs: A, B). The sign for the locally used currency Dollar is USD. 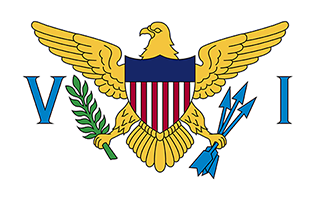 White field with a modified US coat of arms in the center between the large blue initials V and I; the coat of arms shows a yellow eagle holding an olive branch in its right talon and three arrows in the left with a superimposed shield of seven red and six white vertical stripes below a blue panel; white is a symbol of purity, the letters stand for the Virgin Islands. The Danes secured control over the southern Virgin Islands of Saint Thomas, Saint John, and Saint Croix during the 17th and early 18th centuries. Sugarcane, produced by African slave labor, drove the islands' economy during the 18th and early 19th centuries. In 1917, the US purchased the Danish holdings, which had been in economic decline since the abolition of slavery in 1848. On 6 September 2017, Hurricane Irma passed over the northern Virgin Islands of Saint Thomas and Saint John and inflicted severe damage to structures, roads, the airport on Saint Thomas, communications, and electricity. Less than two weeks later, Hurricane Maria passed over the island of Saint Croix in the southern Virgin Islands inflicting considerable damage with heavy winds and flooding rains.